A California State University, Northridge program that provides support to undergraduate students from underrepresented communities to pursue graduate degrees in the mathematical sciences has been named a 2017 Example of Excelencia in Education. The honor, given by the national education nonprofit Excelencia in Education, recognized the work of PUMP (Preparing Undergraduates through Mentoring toward Ph.Ds.) for increasing the number of Latino students who enroll in graduate programs in the mathematical sciences. CSUN was one of only four institutions nationwide named a 2017 Example of Excelencia in Education at the nonprofit’s annual “Celebración de Excelencia” earlier this month in Washington, D.C.
“This is the second time that the PUMP program has received an award,” said CSUN math professor M. Helena Noronha, who started the program. “The first, given by the American Mathematical Society, was a recognition from the mathematical community. This, given by a national nonprofit organization that uses data to select its awardees, not only honors our program, but gives visibility to it — showing that we have a successful model that can be implemented in other disciplines and by a larger community interested in promoting Hispanic/Latino students. In addition to CSUN, the other institutions recognized were Bronx Community College in New York; South Texas College; and the community-based organization Waukegan to College in Illinois. Noronha started PUMP at CSUN in 2005 with a grant from the National Science Foundation (NSF). 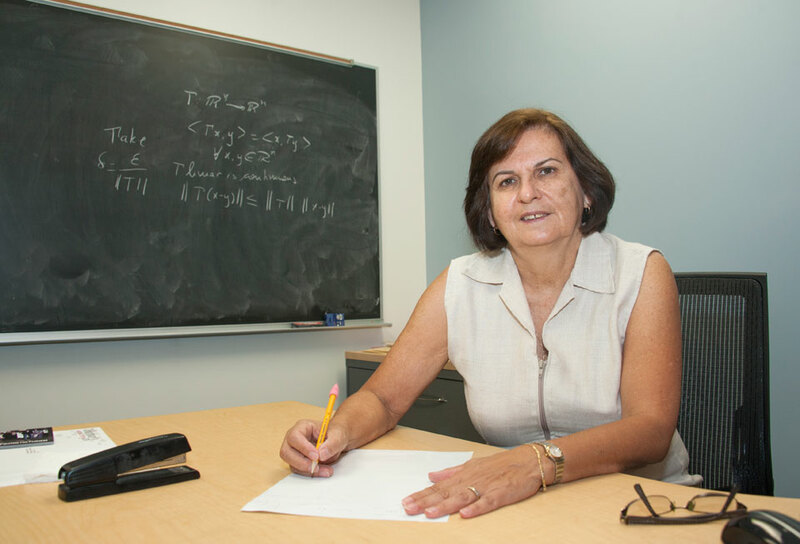 The goal was to prepare students for Ph.D. programs in the mathematical sciences. It was such a success that in 2013, Noronha received a new NSF grant to extend the program to 10 other CSU campuses. A key component of the PUMP program is its summer institute, which pays a stipend to sophomore and junior students to attend four weeks of intensive, rigorous courses in linear algebra and analysis. Those areas were chosen because they are fundamental to any specialization the students might choose in graduate school. Working together in the institute also forges long-lasting bonds among the students and greatly increases their motivation and confidence, Noronha said. The summer institute also provides students with information about how to apply to and succeed in a doctoral program, and about the career opportunities open to them with an advanced degree in mathematics. PUMP also provides the undergraduates the opportunity to do research, offering modest financial support to the faculty and students involved. The program regularly encourages students to apply for off-campus opportunities and provides support for students to attend regional and national conferences. Excelencia is a not-for profit organization founded in 2004 in Washington, D.C. It has become a trusted information source on the status of Latino educational achievement, a major resource for influencing policy at the institutional, state and national levels, and a widely recognized advocate for expanding evidence-based practices to accelerate Latino student success in higher education. Excelencia is also building a network of results-oriented educators and policymakers to address the U.S. economy’s need for a highly educated workforce and for civic leadership. In 2014, CSUN’s College of Engineering and Computer Science was selected by Excelencia in Education as one of that year’s honorable mentions for Examples of Excelencia for the college’s effort to support and mentor students studying engineering and computer science, singling out its Attract, Inspire, Mentor and Support Students (AIMS2) program for special recognition.